The kaleidoscope of specialty cut flowers draws crowds, but the farmers’ resiliency is what helps make Pike Place Market truly vibrant. “Mom’s technically retired, but she’s still on the farm every day,” Scott Chang says as he skillfully arranges a bouquet of brilliant yellow daffodils at his family’s flower stall in Pike Place Market. “If not on the farm, she’s here [at the Market].” In this regard, the apple doesn’t fall far from the tree—along with his mother Chue Chang, 32-year-old Scott is the face of See Lee Farm, tackling everything from weeding peony beds and harvesting tulips to driving the flower delivery van and selling the season’s freshest arrangements at the Market. Scott grew up at the Market, but for Chue Chang, the journey to Pike Place wasn’t easy. As the youngest and only daughter of seven siblings, she was born to a family of farmers in Laos, where her days on the family farm began at dawn. Farming was ingrained in her. So it was a shock in 1980 when Chue and her husband moved to the United States as refugees and could only find work as a fish cleaner on Seattle’s waterfront, and later as a seamstress. The Indochinese Farm Project was Chue’s saving grace. Funded in part by King County and the Pike Place Market Preservation and Development Authority (Market PDA), the Project empowered Hmong refugees to be self-sufficient. In 1983, Chue and her husband, along with a handful of other refugee families, received a 5-acre plot of farmland in Woodinville to establish their livelihood. Within a few years, the couple had built a flourishing farm and began selling produce at local farmers markets—and in 1986, they set up shop at Pike Place Market. Specializing in vegetables to start, the family soon saw an opportunity to enter the flower business. “A lot of the flower farmers [at the Market] were retiring and no one was taking their place,” Scott says. Scott and Chue Chang prepare bouquets. 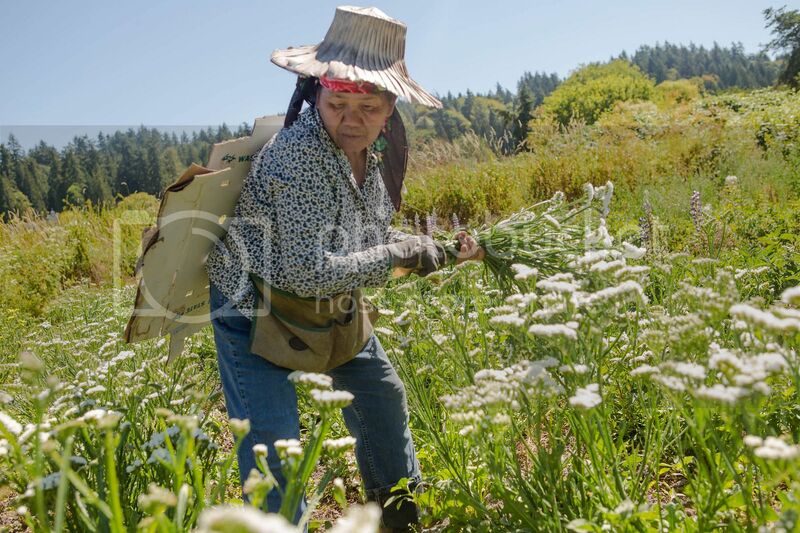 By then, Hmong-run flower farms filled the region, and many of the farmers’ livelihoods were on the line. Fortunately, the Community Safety Net at Pike Place Market was there to catch their fall. Funded by the Pike Place Market Foundation, small grants up to $1,500 are available for farmers, artists and low-income residents when disaster strikes. Last year alone, $34,122 was distributed throughout the Market community. “It helped out tremendously,” Scott recalls. 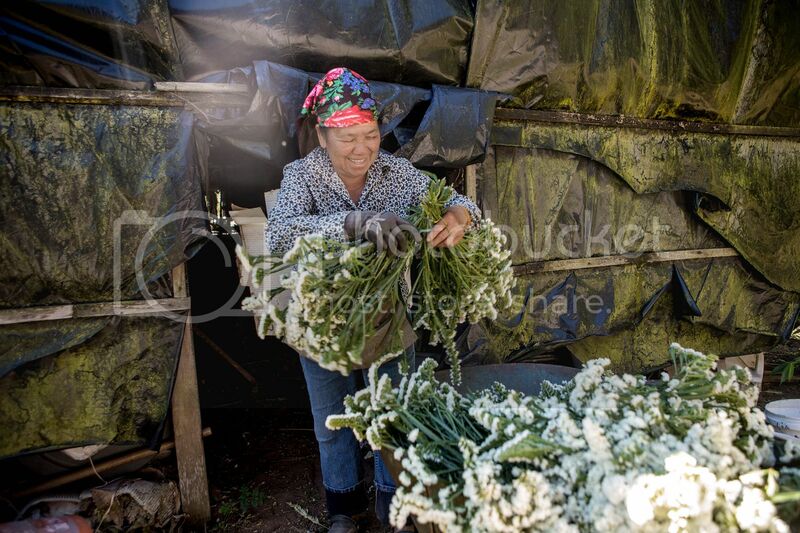 Chue Chang picks statice to dry for winter bouquets. Thanks to the generosity of the Market community, Thai Thao Farm also recovered from the natural disaster—with resiliency and an eye to the future. 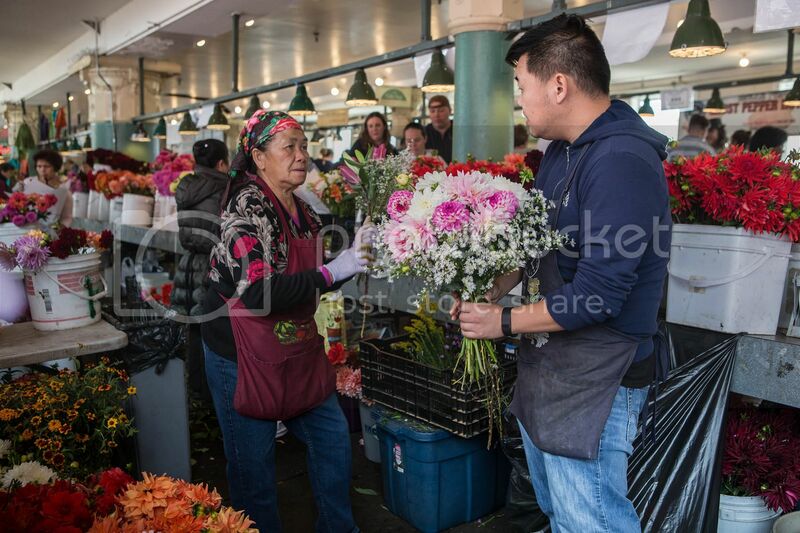 As part of the younger generation of Pike Place flower farmers, 37-year-old Lue Eng is on her way to taking over the family business, which operates out of Woodinville and Duvall. Lue emigrated with her family from Thailand to the United States in 1980, but it wasn’t until she was 11 years old that she began interacting with customers amid the hustle and bustle of the Market. “My mom relies on me a lot to communicate with the customers … because English is her second language,” Lue says. Lue has helped modernize the family business, adapting to changing demand and providing value-added services like wedding flower consultation. A budding florist with an entrepreneurial spirit, Lue attends vendor workshops led by the Market PDA’s farm team to learn about topics like marketing, sales, and the digital world. Chue Chang hangs bundles in the hot house to dry. Pike Place Market Foundation supports the heart and soul of the Market—its people. By helping our neighbors who work, learn and live in and around the Market, the Foundation helps the Market you love remain a thriving, caring community.